Lake Tahoe is a beautiful place. There is no doubt about that. It is also obscenely crowded, especially on a weekend, which is when we showed up. We drove along the north shore, hoping to find a place to hop out and take a look. No such luck! Everything was private property. It looked more like an upscale suburb than a place of natural beauty. It wasn’t until we crossed the Nevada border and got on the eastern shore that a state park showed up and let us pull over and explore the lake a bit. Dammit, rain…go jump in a lake! Again, luck with nature wasn’t on our side. It was overcast, and lightning and rain off in the distance was threatening. So not only was the beauty of Tahoe’s crystal clear water diminished, so was our time looking at it. 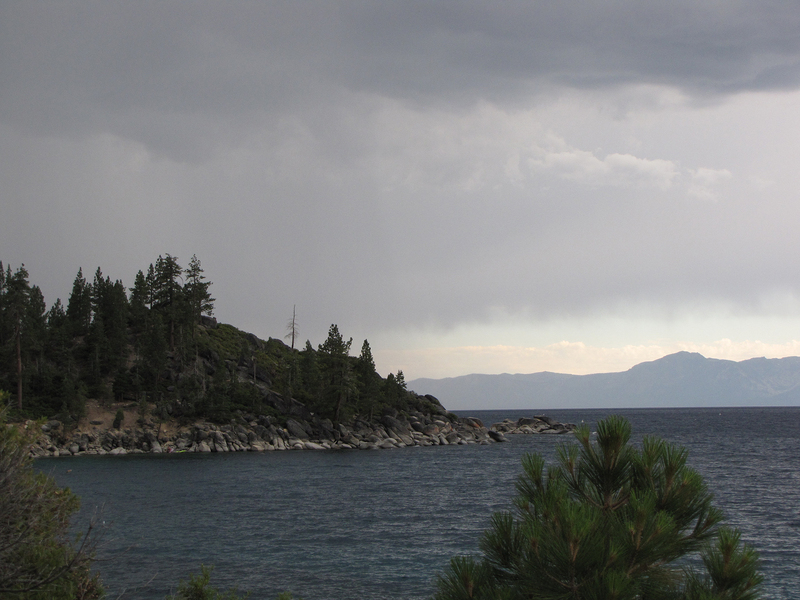 We’d planned to spend most of the afternoon at Tahoe, but we could see the storm creeping closer. Indeed, as soon as we got back in our car, the clouds opened up. So yes, we were rained on in the Grand Canyon, Big Sur, and Lake Tahoe. So in retrospect, it was a good thing our plans to camp hadn’t worked out, but it meant we had to motel it up in Carson City. Let’s not mince words, here. Carson City is a dump. My girlfriend did not believe me when I told her it was the capital of Nevada. “No, seriously!” I would say to no avail. She looked it up, though, and was stunned. And it is hard to believe. There’s not much of value to be seen. Even the capitol building itself is hidden away behind a stand of trees. Even then, it’s pretty non-descript as far as capitol buildings go. No massive rotunda, no towering columns. It was charming in that it was probably the most attractive building we saw in Carson City, though. The next morning, we struck off for Salt Lake City. We listened to Welcome to Night Vale as we drove through the desert, and wished we were seeing anything even a fraction as interesting. Instead, the desolation and isolation gave us time to think. And that’s when the horrible realization settled upon me. We should have gone to Seattle. It was Sunday, and our estimate had us back home by Tuesday night. Our three-week road trip had been reduced to barely more than two. 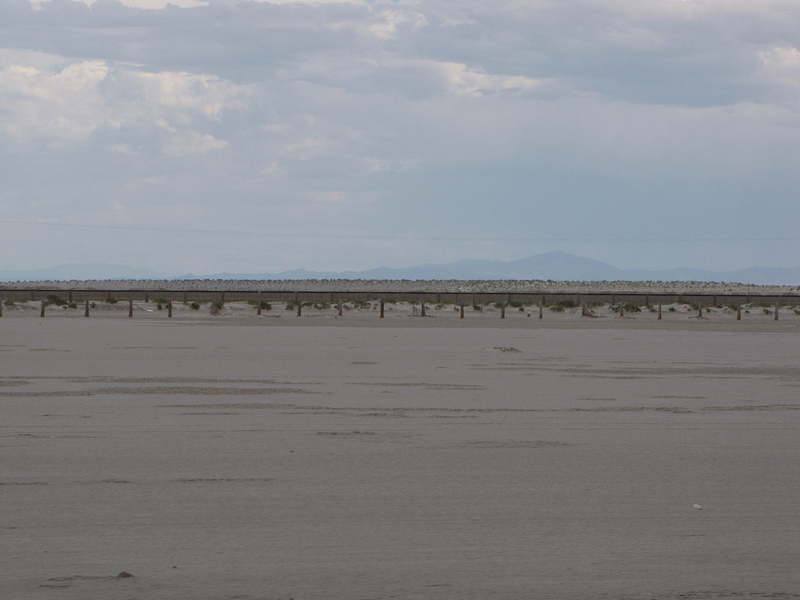 Further, instead of seeing Mount Shasta and Portland and Seattle and Yellowstone and Mount Rushmore, we were cruising through the Scrublands and the Sand Wastes. We knew very little about Salt Lake City or Cheyenne, and weren’t particularly inclined to spend extra nights in either place. So we really were just driving home. The salt flats are exactly as advertised. Full of regret over the trip that could have been, we crossed the salt flats and arrived in Utah’s capital. We waited in line for 40 minutes for Mexican food. Keep in mind, we hadn’t even waited in line for food in Los Angeles. This was supposed to be the best Mexican grub in the city, though. And it was solidly decent. We walked around the Temple Square, and were increasingly creeped out. People like to talk about how beautiful Temple Square is, but they fail to mention that it is walled in and gated…essentially a fortress. This probably says more about the Mormons’ past than it does their present. But considering I hail from the area that kicked the Mormons out more than once, I felt a little uneasy inside their compound. Back in our hotel room, we made a horrifying discovery. Cheyenne was booked solid, as were smaller towns around it. Apparently, some sort of festival was going on with rodeos and whatnot. The end result was that we’d have to drive 10 hours the next day, just to reach the thriving metropolis of…North Platte, Nebraska? Now we really were just driving home. And the mantra we’d been using the whole trip: “NO SLEEP ‘TIL…” just got louder. And so the next day, we drove across half of Utah, and almost all the way across Wyoming on our new “friend,” Interstate 80. We did stop in Cheyenne for a late lunch/early dinner (It was mediocre as hell, by the way. I wasn’t aware you could screw up chicken fried steak aside from burning it, but there it was.) and check out this “festival” that had clogged the hotels and had us dashing across three states in one day. I will say…the locals were pretty excited about it. From what we could understand, it was a week-long thing that had just started, so we were just seeing the “dawn” of this event. That being said, we were underwhelmed. We drove on. 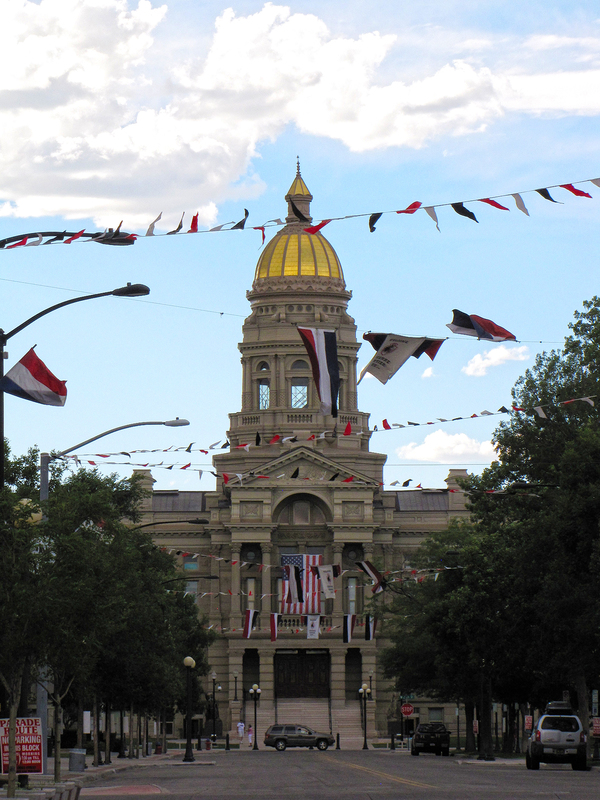 Cheyenne’s capitol building, festooned for the festivities, whatever they were. In Nebraska, our old enemy the rainshower cropped up again, but at least this time we weren’t camping or wanting to go for a hike or just look at a goddamned lake. It just made our first bit of driving under cover of darkness a little more interesting. We arrived in North Platte at nearly 11pm and checked into our jam-packed motel for the night. I really don’t know what exactly was going on in this part of the country that motels were booked up on a Monday night in the middle of July, because we were too tired to ask. In case you’re wondering, North Platte’s major claim to fame is that Buffalo Bill Cody lived there. Indeed, he owned 4,000 acres and started his Wild West show in North Platte. This is all interesting in the dim sort of way that the undersides of Snapple caps are interesting. I myself am usually enthusiastic about history, but I couldn’t bring myself to care about Buffalo Bill’s estate. We left North Platte the next morning after oversleeping and sending some ironic postcards. We went through Lincoln, our fifth-straight state capital. Their building was radically different than most of the others we saw. They favor a tower instead of a rotunda, and on top of the tower is a statue of “The Sower.” It should have been of a Department of Transportation worker. Nebraska has more highway construction projects going on than I believe is logistically feasible. We passed through probably 15 “Work Zones” where the highway had been reduced to one lane just on our trip across I-80. And from what I remember, none of them actually had any work going on. That is, until we passed Lincoln and got off I-80. Then one state road was undergoing a complete resurfacing that required a “Pilot Car” to navigate us through, and another road we’d planned to take was closed entirely. In the end, our major impression of Nebraska was that it is a state rich in traffic cones. Iowa! We drove through it! For about 20 minutes! It blew our minds. I don’t even want to discuss it, for I may run the risk of diminishing the experience. And then, we were back on home soil. I blared the Missouri fight song as we crossed the border and kept heading south to Kansas City. We played “No Sleep ‘Til” by the Beastie Boys and screamed “BROOKSIDE” instead of Brooklyn. (Truth be told, we live in Waldo, but we’re close, and Brookside sounds better.) About an hour later, we blew kisses and waved at Downtown KC as we passed by. And about 20 minutes after that, we arrived back where it all started two weeks and two days earlier, our humble apartment. The epic journey was at its end. We had survived. And for the first time that we could remember, our cat was actually happy to see us. 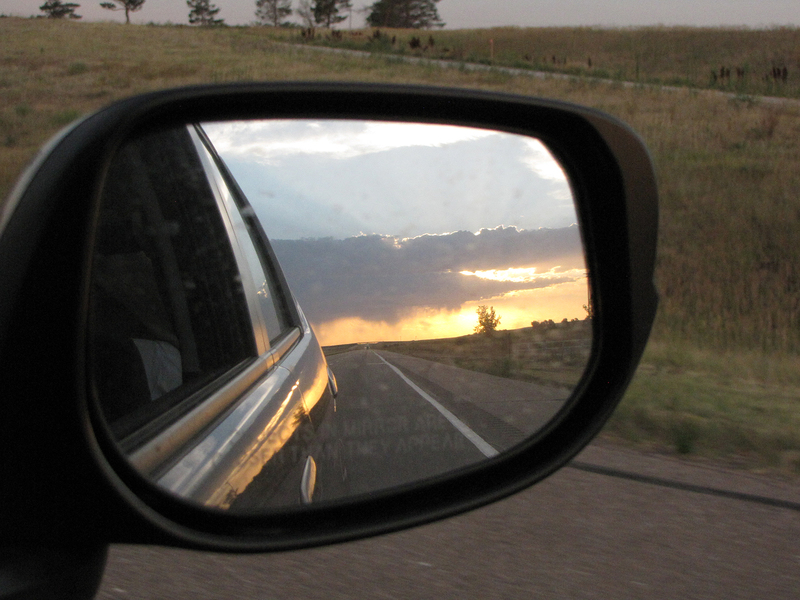 Tags: Kansas City, Lake Tahoe, Missouri, Nebraska, Nevada, road trip, travel, Utah, writing, Wyoming. Bookmark the permalink. All I remember of Utah from passing through it twenty years ago is that it smells bad. And it was Kansas that was under construction then, but I suspect at least one of the plains states is always rich in cones. Perhaps they rotate nuisance duty each year. Yeah, Utah does smell odd at first, but you either get used to it pretty fast, or it’s not as bad in the city.